Cast: Ewan McGregor, Nicole Kidman, Richard Roxburgh, John Leguizamo, Jim Broadbent, Kylie Minogue. Rated: (mature themes and sexual situations). Reviewed by Dustin Putman, June 2, 2001. One does not watch Baz Luhrmann's phantasmagoric ode to Hollywood movie musicals of yore, "Moulin Rouge," as much as one feels as if they're living it. A trippy carnival ride through sensory overload and non-stop visual marvels, it is a wildly imaginative and sincerely audacious motion picture that has the ability to single-handedly revive one's faith in the movies, as they have begun to dwindle with the summer season currently upon us. The story is simple, yet powerful. Set in Paris, circa 1899, Christian (Ewan McGregor) is a penniless writer who has just arrived in the town of Monmartre, home of the infamous Moulin Rouge nightclub. When Christian has a chance encounter with a group of petty unconformists, led by dwarf Toulouse Lautrec (John Leguizamo), and helps them to come up with the lyrics of "The Sound of Music" for the musical revue they are preparing for the Moulin Rouge, they immediately hire him to be their writer. They also set up a meeting with gorgeous courtesan Satine (Nicole Kidman), whom they want for the female lead of what they have entitled "Spectacular Spectacular!" 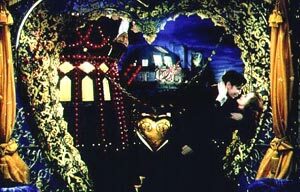 At first mistaking him for a wealthy duke, Satine falls instantly in love with Christian, and vice versa, much to the chagrin of the real duke (Richard Roxburgh), who has not only just staked a claim in Moulin Rouge, but has gotten the club's owner, Zidler (Jim Broadbent), to sign an agreement giving him exclusive rights to Satine. And although Christian and Satine do not yet know it, Satine has been diagnosed with a fatal case of tuberculosis. "Moulin Rouge" is as deeply romantic as any film in recent memory. Christian is a wistful young man who believes in four aspects of life: "truth, beauty, freedom--and above all others--love." Satine, on the other hand, is both a singer/dancer and a prostitute, and has been trained to never fall in love. In one of the film's most awe-inspiring, magical sequences, Christian serenades Satine with Elton John's "Your Song," to which they get so caught up in their feelings for one another that they are lifted out of the building window and onto the clouds in the sky. For the first time in her life, Satine feels something other than fake emotions for a man in her life, and it's an exhilarating rush. Their joy in finding each other does not last, however, as the wealthy duke enters the picture with an unfair proposition to make. The sparks that actors Ewan McGregor and Nicole Kidman ignite as hopeless romantic Christian and unsure realist Satine are so bright, they're almost blinding. Their chemistry, for once, feels genuine, rather than "written," and it is the doomed love story of these two people that turn the movie into such a complex and touching experience. McGregor (1999's "Star Wars: The Phantom Menace") and Kidman (1999's "Eyes Wide Shut") are stunning in their roles, eliciting both the passion and determination that any two people have who are in love. Both of them, as well as the rest of the actors, sing their own songs, and they turn out to be startlingly talented at it. Special notice must go to Kidman, who has never been better. Often coming off as somehow aloof, Kidman fills Satine with a warmth that has never before been witnessed from the actress. Aside from its two stars, where "Moulin Rouge" excels is in the almost non-stop barrage of singing. About 85-percent of the story is told through the original art form of song, all of which are classic pop tunes and love ballads from post-1899. Just because we are in turn-of-the-20th-century Paris, director Baz Luhrmann so convincingly argues, doesn't necessarily mean that people back then couldn't have the right to sing everything from Dolly Parton's "I Will Always Love You," to The Beatles' "All You Need is Love," to David Bowie's "Heroes," to Madonna's "Like a Virgin," to Sting's "Roxanne," to Nirvana's "Smells Like Teen Spirit." The film plays like a veritable who's who of '60s, '70s, and '80s music, and it is not only smashingly entertaining, but actually serves a strong purpose within the narrative. Each musical number--and there are a lot of them--are orchestrated with such unabashed energy and passion that you can't help but drift away in its rapturous spell. With "Moulin Rouge," Baz Luhrmann (1996's "William Shakespeare's Romeo + Juliet") has made his first masterpiece as a filmmaker. The camera is constantly moving, swooping around people and objects, or zooming into building windows or through beautiful city landscapes. It is not done to keep the interest of the attention-impaired, though, but to simply aid in creating a glitzy, one-of-a-kind universe. Additionally, the story, written by Luhrmann and Craig Pearce, is just strong enough to be fully satisfying, while not being bogged down by overplotted developments. In a day when so many motion pictures strive for nothing more than adequacy, "Moulin Rouge" is alive with creativity and wonder, proving that the medium of film can take us anywhere, and act upon us in any way possible. One part comedy, one part romance, and one part tragedy, "Moulin Rouge" is a remarkable triumph, as well as the first truly brilliant film of 2001.